Corticosteroids are known to cause many systemic side effects when administered by oral and parenteral routes. These include excess weight gain, cushingoid habitus, osteopenia, gastritis, avascular necrosis of femur head, excess body hair growth, premature closure of bony epiphysis, etc. Ocular side effects such as glaucoma and cataract associated with topical and systemic corticosteroid use are well-recognized. Systemic toxicity associated with the use of topical corticosteroid eye drops is rare. A 6-week-old boy was presented to our tertiary eye care center with bilateral white reflex. On examination, both eye congenital cataracts were noted. Ocular ultrasonography was suggestive of normal posterior segment and short axial lengths (16.20 and 16.35mm) in right and left eye, respectively. There was microphthalmos in both eyes. Horizontal corneal diameters were 9 mm in both eyes. Anthropometry and systemic examination was unremarkable. Peripartum history was normal with normal birth weight. There was no evidence of congenital rubella infection. The patient subsequently underwent phacoaspiration with primary posterior capsulotomy without intraocular lens implantation right eye followed by the left eye at an interval of 6 weeks. Patient was started on topical betamethsone 0.1% eight times, tobramycin 0.3% six times, and homatropine 2% two times a day. Excess postoperative inflammation in the form of anterior chamber reaction and fibrin was noted in the immediate postoperative period. Three weeks after right eye surgery revealed visual axis obscuration due to formation of membrane in the pupillary area leading to a smaller pupillary aperture. Right eye required pupilloplasty to clear the visual axis. Following the pupilloplasty, the dose of topical betamethasone 0.1% was increased to 12 times a day in the immediate postoperative period to prevent excess inflammation and subsequent visual axis obscuration. Two weeks later, left eye cataract surgery was performed and was started on intense topical steroids to prevent pupillary membrane formation as was the case in the right eye. At 3-weeks follow-up, examination under anesthesia (inhalational anesthetic, Sevoflurane was used) revealed elevated intraocular pressure (IOP) (with Perkins handheld applanation tonometer) of 30 and 28 mmHg in the right and left eye, respectively. The child subsequently required pupilloplasty in both the eyes due to recurrent visual axis obscuration and was initiated on similar treatment regimen along with antiglaucoma agents. 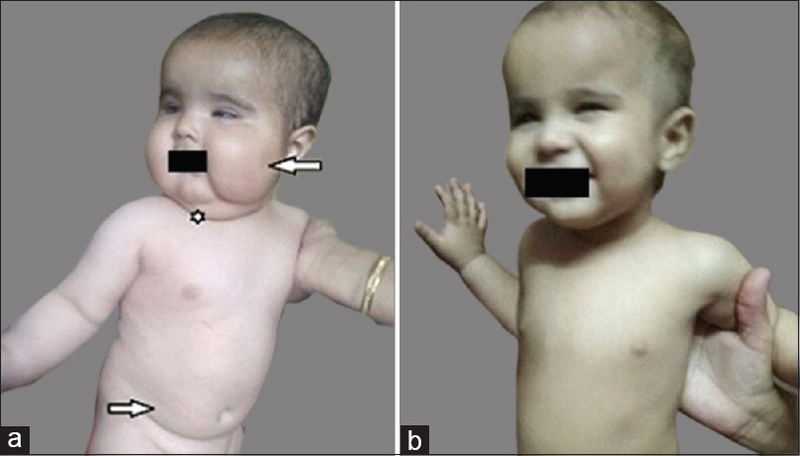 Physical examination at 6 weeks follow-up showed cushingoid habitus with a moon face, buffalo hump at the back of neck, and truncal obesity was noted due to excess centripetal fat deposition mainly in buccal, neck, and trunk regions [Figure 1]a. Body weight had increased from 3.2 Kg (−3.5Z) to 4.2 Kg (−3.1 Z) during the treatment period of 6 weeks. Weight gain in this period was similar to the age-related weight gain for the child; however, there was altered body fat distribution. Cumulative dose of topical steroid was 0.5 mg/Kg body weight during this period. Other systemic causes and endocrine abnormalities were ruled out by appropriate investigations. Ultrasound abdomen did not reveal any adrenal mass. On evaluation, it was found that serum adrenocorticotrophic hormone (ACTH) levels were suppressed (ACTH level < 0.1 pg/mL; reference 5–27 pg/mL). As ACTH levels were low, ACTH-dependent causes of Cushing's syndrome (pituitary hypersecretion, ectopic ACTH tumor) were unlikely. In view of the aforementioned characteristic clinical features, prolonged use of topical steroids and suppressed ACTH level; a diagnosis of exogenous steroid toxicity was considered and topical steroids were gradually tapered. The patient was started on dorzolamide (0.1%) and timolol (0.5%) combination twice a day for control of IOP. He was added on topical nepafenac sodium (0.1%) suspension, while topical steroids were tapered. All systemic features subsequently subsided and intraocular pressure also normalized. At 3 months follow-up there were no cushingoid features and normalization of ACTH level at 10 pg/mL (5–27 pg/mL) [Figure 1]b. Weight and height at 6 months of age was 5.5 kg (−3.3 Z) and 60 cm (−2.8 Z), respectively. In view of temporal association with topical steroids and reversal of all corticosteroid toxicity symptoms and laboratory parameters final diagnosis of iatrogenic Cushing's syndrome secondary to ocular steroids was proffered. This is the first case report of systemic steroid toxicity secondary to use of topical ocular corticosteroid in infants. Hence, it is very important to observe pediatric patients especially infants on topical steroids drops for signs of development of systemic toxicity, to which they are particularly very susceptible. Morr H. Theory and practice with inhalation steroids -systemic effects and side effects. Pneumologie 1991;45:85-9. Petri M, Purvey S, Fang H, Magder LS. Predictors of organ damage in systemic lupus erythematosus: The Hopkins lupus cohort. Arthritis Rheum 2012;64:4021-8. Becker B. Intraocular pressure response to topical corticosteroids. Invest Ophthalmol Vis Sci 1965;4:198-05. Armaly MF. Statistical attributes of the steroid hypertensive response in the clinically normal eye. Invest Ophthalmol Vis Sci 1965;4:187-97. Kaur S, Dhiman I, Kaushik S, Raj S, Pandav SS. Outcome of ocular steroid hypertensive response in children. J Glaucoma 2016;25:343-7. Messina MF, Valenzise M, Aversa S, Arrigo T, De Luca F. Iatrogenic Cushing syndrome caused by ocular glucocorticoids in a child. BMJ Case Rep 2009;2009. pii: bcr11.2008.1224. McGhee CNJ, Dean S, Danesh-Meyer H. Locally administered ocular corticosteroids: Benefits and risks. Drug Saf 2002;25:33-55. Ozerdem U, Levi L, Cheng L, Song MK, Scher C, Freeman WR. Systemic toxicity of topical and pericocular corticosteroid therapy in an 11-year-old male with posterior uveitis. Am J Ophthalmol 2000;130:240-1. Chiang MY, Sarkar M, Koppens JM, Milles J, Shah P. Exogenous Cushing's syndrome and topical ocular steroids. Eye (Lond) 2006;20:725-7. Steelman J, Kappy M. Adrenal suppression and growth retardation from ocular corticosteroids. J Pediatr Ophthalmol Strabismus 2001;38:177-8.